Multi-tasking reaches a new level with the Mountie! 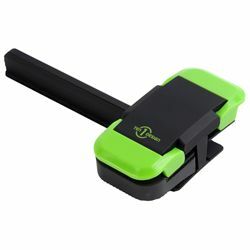 This stylish and reliable mount attaches your phone to the side of your laptop monitor. Enjoy eye-level video chats, monitor your Twitter feed, iMessage with family, or even host a live recording session with friends from afar. The rubberized grip ensures your devices are held securely. The Mountie includes swappable inserts which offer near-universal compatibility. Mounties innovative clamp affords easy on and off. Compatibility: iPhone® 4 and later iPad® Air 1 & 2, all iPad mini products, any tablet or phone between 5.0mm and 9.0mm, all MacBook models and any iMac® made after 2012.